Fall down the rabbit hole, take flight into Neverland, or follow the yellow brick road to the Emerald City; we all remember what it was like to disappear into the imaginary worlds of the most magical and fantastic type of literature, the children’s book. Now, with 1001 Children’s Books You Must Read Before You Grow Up, be ready to be transported back to a time when magic was possible and share that love with your children. Compiled and edited by Lovereading4kids’ very own editorial expert Julia Eccleshare and with a Preface by Quentin Blake, this is a wonderful offline resource that provides a great introduction to the very best books of childhood. From wordless picture books and books introducing the first sounds of the alphabet through to hard-hitting and edgy teenage fiction, the titles featured reflect the best of children’s literature from the international classics to the most famous contemporary writers. So whatever the reading age or ability, there is something to suit every child. Reviews of the books are accompanied by evocative line drawings and colour artworks from the books themselves, together with reproductions of original jackets and photographs of the authors. In addition, some of our most famous, familiar and much loved children’s authors write about their favourite story by another author. Including great writers and illustrators such as: Philip Pullman, author of Northern Lights, Ruby in the Smoke; Michael Morpurgo, author of Private Peaceful, and Kensuke’s Kingdom; Jacqeline Wilson, author of the Tracey Beaker books; Lauren Child, author of the Clarice Bean books and Eric Carle, author of the much loved The Very Hungry Caterpillar. And the question on everyone’s lips is what is their favourite story of all time? Well, snuggle down with this book and you can discover it - and maybe you will read a story that you have never read before and will love it as much as they do. You’ll find many of the titles featured on Lovereading4kids, so check out an extract if you want more information on a title than you can get in this book. 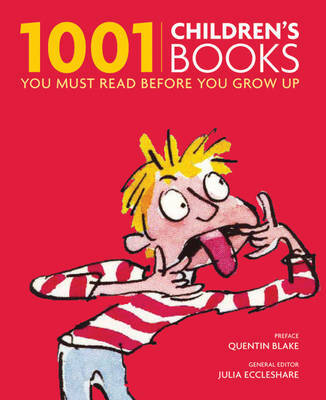 1001 Children's Books You Must Read Before You Grow Up is the perfect introduction to the very best books of childhood: those books that have a special place in the heart of every reader. It introduces a wonderfully rich world of literature to parents and their children, offering both new titles and much-loved classics that many generations have read and enjoyed. From wordless picture books and books introducing the first words and sounds of the alphabet through to hard-hitting and edgy teenage fiction, the titles featured in this book reflect the wealth of reading opportunities for children. Browsing the titles in 1001 Children's Books You Must Read Before You Grow Up will take you on a journey of discovery into fantasy, adventure, history, contermporary life, and much more. These books will enable you to travel to some of the most famous imaginary worlds such as Narnia, Middle Earth, and Hogwart's School. And the route taken may be pretty strange, too. You may fall down a rabbit hole, as Alice does on her way to Wonderland, or go through the back of a wardrobe to reach the snowy wastes of Narnia.